A much simpler footer information block addon. 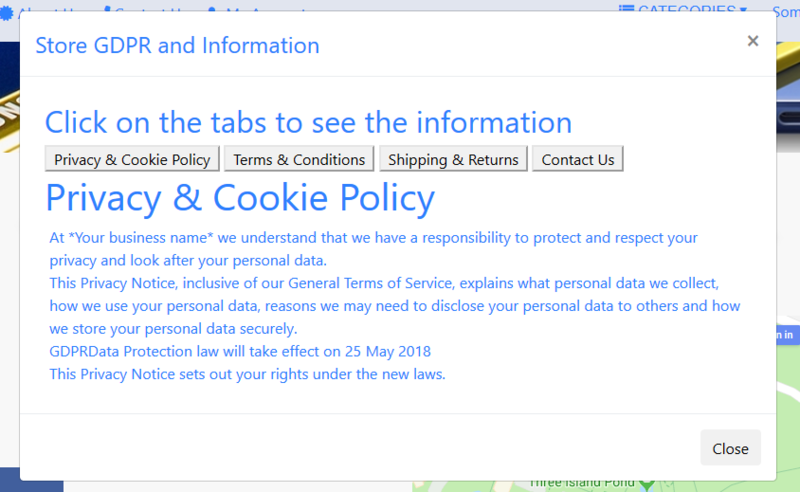 It gives you the information links and as modal popup with tabs so all GDPR , T&C and Shipping & Returns are all shown in one popup with tabs. The contact us is still separate link. 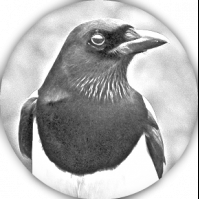 Reduces the information footer block to just 2 nav pils. Why? Well gives a cleaner look to the footer and makes reading information much better for the customer. On large sites it can take time to find what your looking for. With stock osC if having found it you press a info link your taken away from the page you were looking at. With the Tabbed popup the page stays behind the popup and when you close the popup you carry on with what you were looking at. Again totally stand-alone with no core code change. Once you have copied all the files over go into admin/Content /Modules and install “JCM GDPR Information Links Block”. Turn it on and turn off the stock info block or another you may have uninstall it. This version will not change the contact us link. That remains as new window. The other stock links are not replaced. We make new ones for the modal tabs so you can revert back anytime you like. To add new text for each modal tab simply edit language file, keep it plain text. Nice but you forgot something very important. The customer must approve or not approve script like google analytics, facebook, twitter ...... ! You must include a modular approach by hooks to allow the coder to develop their own module. Yes, but that is one for the profesional coders not me. I just give the user the option to use if they wish. For cookies they can use this. Even with this they need to add own custom script depending on what cookies they are forcing. Or beter still get a developer to do it properly. I love this module Zahid @JcMagpie !! One question: in addition to the Contact Us link, can I place another link under "Contact Us" as "site map"? I don't look a code. It's just a critic to improve the modules. Mappy proposes to make a specific cookie because every shop owner has their needs. It can be an orientation also. I like the constructive criticism thanks for contributing! 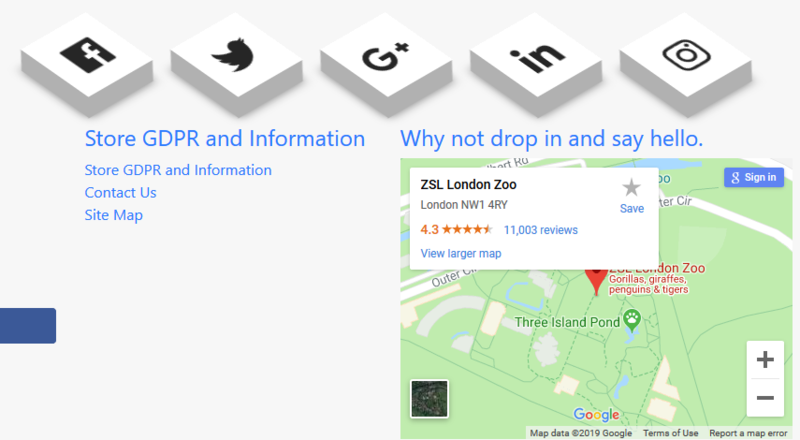 can I place another link under "Contact Us" as "site map"? Sure, if you edit template file you can add more links. and if you have done it right and you have a sitemap.php file you will see the new link as below, any problems just PM me. I have a conversation by email about that with JC. This is this contribution and I let him to decide what it wants to propose or not. Thanks for the pointers Loic, i will look at making a new header tag add-on with the script you recomended. It's not as simple as it first looks so will take my time and see if i can get it to work on my test site. If i fail will ask for help 😊. Thank you @Gyakutsuki with your help got it working. It works fine, but as you said It's not posiabe to make a add-on that will just work with any shop. I've made it so the user can add 10 scripts using admin with no db changes. Added footer add-on to embed the custom scripts into <body> tag as required. It still need more work to add your language code. Anyone intrested can see it on the test site. All futher pages can show small tab. This lets user make changes as required on any page. Cool You are a pro now !